You can tell China is a about 95% homogeneous society just by some of the vocabulary. When people see you sometimes children will shout, ‘waiguoren/meiguoren’ meaning Foreigner or American. I like to shout back ‘zhongguoren,’ meaning Chinese. In the US people never think twice about foreigners. We don’t go around shouting.. ‘ALIEN!’ Oh if only. My name at the school isn’t really Heidi…it’s more ‘Waijiao’ — foreign teacher. So many people tend to think the Chinese are so intelligent, so well behaved, so bright, so modest, etc etc. After teaching middle school you get a whole new picture. My kids are socially starved. They are very much social animals but only in that, they need to get studying done, they don’t have very much fun, they memorize, memorize, memorize, memorize, and memorize some more. The memorizing is especially apparent in their speaking. Everything is a regurgitated sentence or tone. Nothing else..not even a question about why shouldn’t they answer any differently. In class kids love doing everything except listening. Which is fine. I hated school, I hated my teachers until college. But it does get on my nerves. Kids will throw chalk constantly..11-15 year olds! They will listen to their mp3 players or play on their cell phone. She said she was translating and I said then why am I am listening to music? I didn’t give it back to her for about a month. Boys will hang all over each other. For some reason they have to be holding one finger from their friend’s hand. Girls don’t tend to hang all over each other like the boys do. My class is a joke which is a shame. The students do not get graded. Whenever I took foreign languages I loved it. I loved learning the culture of the language, funny slang, idioms, jokes, terms, etc. These kids, no interest whatsoever. They say they’re interested but I think they just love not being stressed out during a class. This has been the most challenging, rewarding, difficult, easy, job I’ve ever had. Every day there’s a new challenge. I’m glad this semester is over. Next semester I’m letting.. THE BEAST FROM THE EAST out. RL Stine Goosebumps style. 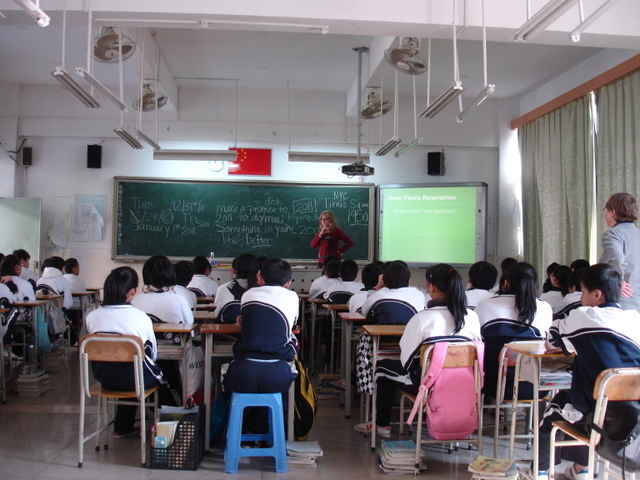 This entry was posted in Uncategorized and tagged Chinese culture, Chinese students, learning, longhua. Bookmark the permalink. Let me know how the Beast From the East works out… kind of reminds of the book about the kids who were so bad in the class room and the teacher disappeared to be replaced with a mean witch until the kids started behaving again! 🙂 I miss you! I always think about that book too! !